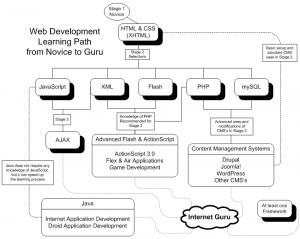 Ever wonder what you would need to learn to go from a novice web developer to an internet guru? If you are just getting started as a web developer it can be confusing and even discouraging to try to figure out which technologies to learn and in what order they should be learned. If you’ve taken some time off from learning new technologies, you may feel like you are behind the times in your web development skills. Maybe you just learned a technology and are just curious as to where to go from where you are at. In any case, I hope this diagram helps you out. 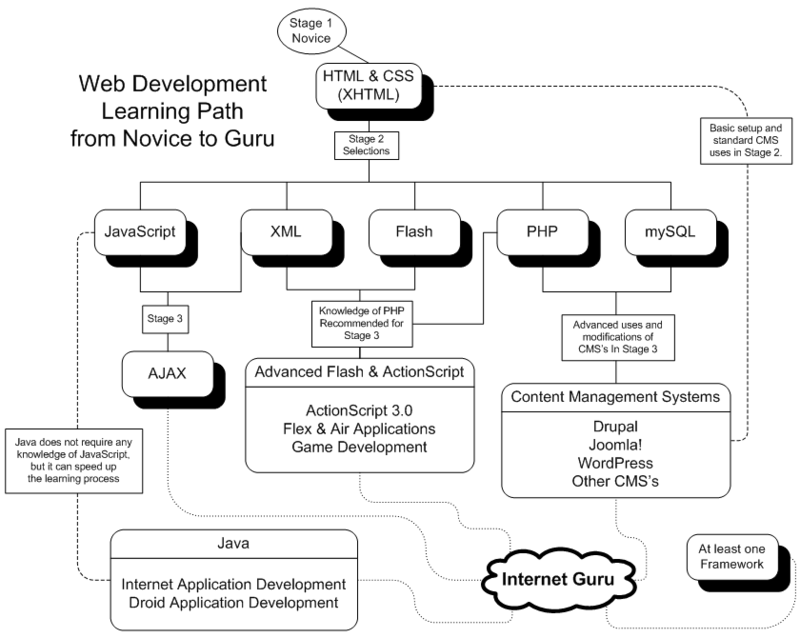 The diagram I created gives only one of the possible paths an individual can take to go from complete beginner to master developer. There are, of course, many alternate paths, many listed technologies that can be skipped over, and even more technologies that can be added to your personal path in learning to develop for the internet. Web development skills are as varied as the individuals who use them, but I think this graphic offers a nice generic example of the skills that are in highest demand. I hope this chart helps you figure out your own path and gets you on track towards your spot on the internet guru cloud in the sky. Buy:Maxaman.Viagra Soft Tabs.Cialis Soft Tabs.Zithromax.Cialis Professional.Cialis.Viagra Super Active+.Viagra Super Force.VPXL.Cialis Super Active+.Viagra.Soma.Super Active ED Pack.Levitra.Viagra Professional.Tramadol.Propecia…. Buy:Synthroid.Actos.100% Pure Okinawan Coral Calcium.Human Growth Hormone.Arimidex.Prednisolone.Retin-A.Prevacid.Zovirax.Mega Hoodia.Accutane.Valtrex.Lumigan.Nexium.Zyban.Petcam (Metacam) Oral Suspension….